There are two distinct species in this family. The Atlantic variety (Istiphorus albicans) and the Indo-Pacific variety (Istiophorus platypterus). Based on their scientific names, can you guess where each one lives? 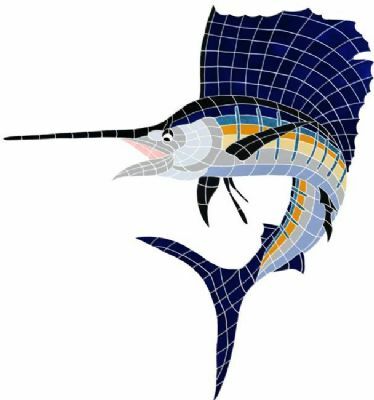 Sailfish are a native of warm regions of oceans worldwide, so they are truly an international entity among sport fishes. They are easily recognized by the large fin that runs from the back of the head to the tail, known as a sail. These large, fun to catch fishes are usually blue to gray in color and have a long pointy bill, like those of other marlins. Spawning is thought to be in the warmer summer months in water that is fairly shallow, where mating males and females will swim side by side. Sometimes a group of 2 or 3 males will stalk a female. Figures, huh? Eggs are released into the open water and drift down. A single female can release up to a million eggs during the spawning season, but only 6 to 10 of those will see adulthood. The male(s) come along and release milt to fertilize the eggs, which then hatch within 36 hours. The new hatchlings will be about 3/8" long. These little ones grow fast attaining a length of 48" to 60" in the first year of life. They can reach a maximum length of around 10 feet and weigh close to 200 pounds. Larger ones have been seen, but how much fish do you need to catch to have fun? The world record was caught in 1994, weighed 141 pounds and was over 10 feet in length. That was one whale of a sail! Fun fact: The sail is not used for navigation purposes, but rather as a hunting or defense tool. 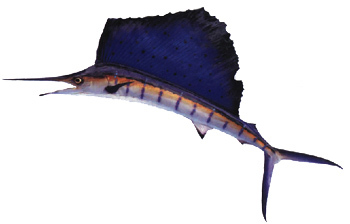 When the Sailfish is swimming along, the sail is laid along the side of the body. The diet consists mainly of just about any fish that will stay near the water's surface. Tuna is preferred, but mackerel, jacks, and squid are also favorites. Because of their large size, they pretty much eat when they want to. Interesting is the fact that they will hunt in groups and use their large fins to form a wall to prevent the prey from escaping. Well, we eat this fish a few different ways. Because of the size of the fish, it usually comes as steaks and are grilled like halibut. The most common way is to saute the meat with butter, wine, garlic and peppers. Sometimes confused with the Swordfish, our guy is in an entirely different family. Swordfish grow to be as much as twice to three times the size of "Sails". The body of a Swordfish is more compact from front to back, so they are rounder and a bit of a "fattie". Another defining feature is the lack of a long dorsal fin.